Produce, produce everywhere! What a joy to eat! (my apologies to Coleridge!) Click on picture if you want your mouth to water. Last week Clay and I had dinner at a Mexican restaurant and I had the most wonderful dish called Pollo Yucatan, which is chicken prepared with spices from the Yucatan Peninsula of Mexico. The entrée I had was served on a bed of rice and topped with grilled vegetables so I was inspired to try my own version of this at home. After doing a little research to see what is usually in this dish, here is the recipe I came up with. Next time I will make it a bit spicier now that I know what to expect! Clean and pat chicken dry. Cut into long strips. Place in baking dish. Mix together orange and lime juices, cumin, ancho chili pepper, and about 2 tsp. salt. Pour over chicken and marinate for several hours or overnight in fridge. Sauté garlic in ¼ cup olive oil. Drain chicken, reserving juices, and brown over medium heat. Add some of the marinade to soften and add flavor. Cook until well done. Slice all vegetables and sauté in large skillet, sprinkling with garlic powder and salt. The vegetables should be golden but still have some crunch. This process is so much more fun if you are listening to this music while you chop and slice. Serve chicken over a bed of rice (I am a little obsessed with Jasmine rice right now so that is what I used) and top with vegetables. 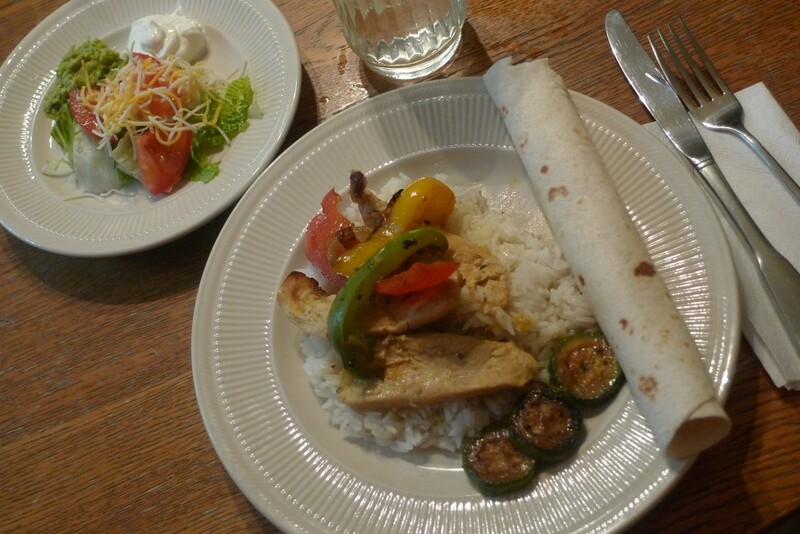 On the side, serve warmed tortillas and a salad of lettuce, fresh tomatoes, guacamole, and sour cream. Sprinkle with a little Mexian cheese mix if desired. It can also be eaten rolled in the tortilla like a fajita. Bon apetite or whatever they say on the Yucatan Peninsula! The little asian store near our house has jasmine BROWN rice. . . very inexpensive, too. We like it a lot. I need a little Asian store in which to shop. Canton has little stores and cute, petite, little Asian ladies but no little Asian stores. I love brown rice so that sounds wonderful.